Shocking neon sports luxe and pretty pastel candy candy colours are some of the big trends of SS14. I love both although sway towards pastels as they can be a bit easier to coordinate. I am in love with the Jessica Simpson Ditsy Print Neon Hem Dress that combines my love of monochrome, floral print, dip dye clothing and neon! Neon is great for adding a splash of colour to a boring outfit or helping to stand out from the crowd on a night out. Be daring and team up with the spring beauty look using Illamasqua Lipstick Liable & Nail Varnish Gamma Duo for orange red lips and tips! Pastels can be a far safer way to go and offer a softer, girly and feminine look. As much as I like my pastel t0nes I usually only wear one pastel piece in an outfit, it can look a little twee if done over the top! Pastel polishes are very easy to get hold of this spring and are an easy way to bring candy colours to your wardrobe! I love the River Island Pink Geometric Print Tote Bag, it gives a funkier edge to the usual pastel pieces. 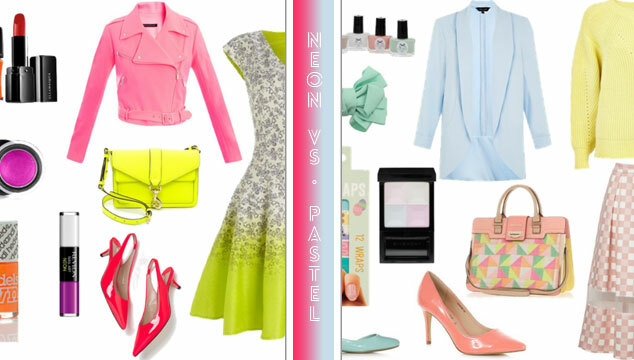 Are you team Neon or Pastel? Previous Post WordPress vs Blogger – Which is right for you? Next Post Primark and MUA Nail Polish – Are Cheap Nail Polishes Worth It?